Don't Touch Those Baby Deer or Other Animals! Facebook is lighting up with photos of baby deer and other wildlife in Canyon Lake sitting alone, looking pitiful and vulnerable. Stories of area residents intervening to “save” the cute little ones abound. Don’t succumb to the Bambi syndrome! Don’t try to “save” them. “Every year, particularly during the spring and summer, hundreds of young wild animals are unnecessarily picked up by the general public and referred to game wardens or wildlife rehabilitators for treatment and rearing. “The most commonly referred animals are baby birds and deer fawns. While most of these animals are picked up by well-meaning persons, it is important to realize that many such human-animal encounters are unnecessary and can even be detrimental to the wildlife concerned. “A recent study conducted by Texas rehabilitator Ann Connell found that, in some years, 40-percent-or-more of the deer fawns referred to her were not orphans or injured, but “kidnapped” from their mothers. “Typically these incidents were well-meaning but misguided attempts to “save” seemingly abandoned fawns. Anecdotal data suggest that the situation for baby birds is similar or worse. These data indicate that such unnecessary referrals to rehabilitators are not only detrimental to the wildlife, but also disruptive and costly to wildlife rehabilitators during the time of year when they most need to concentrate limited resources on truly orphaned or injured wildlife. “The following information should help you to avoid handling or picking up baby animals unnecessarily, handle such animals in a way to minimize stress or trauma, and maximize the animal’s chances of being successfully returned to the wild. Please share this information with other people in your community. Remember, a young animal’s best chance for survival is with its natural parents who, better than anyone else, can ensure that it retains all of its natural faculties and behaviors for survival in the wild. Click here to contact a qualified wildlife rehabilitator in Comal County. “Because of the danger of disease transmission, any suspected orphan should be kept away from domestic pets. In addition, there is considerable risk to anyone handling a wild animal. Please see the Texas Department of Health’s Zoonosis site for information about diseases transmissible from animals to humans, particularly rabies. Know their risks! Know the laws! Read about Texas’s Rabies Quarantine on the Texas Department of Health website. “Also, because young animals can inappropriately identify pets or people as their parents, they may lose their natural fear and become more vulnerable to predation or injury as they mature. These animals are referred to as “human imprints,” a condition which is often irreversible, and may doom the animal in question to life in captivity or euthanasia. “Any time you have an orphaned or injured wild animal, you must remember that the animal may be in pain or in shock. “One sign of shock involves unusually docile behavior in what is otherwise a wild animal. Handlers should beware, as the animal may be temporarily stunned, especially if it was found on or near a road. “All adult and most juvenile wild animals will attempt to defend themselves from perceived danger by whatever means are available to them. Birds of prey may bite or use their talons to “foot” a handler; herons and bitterns may thrust their beaks at the eyes of their would-be human saviors; and all mammals can scratch and bite. This is not the result of a vicious nature – it is merely an effort to keep themselves from being killed and eaten. “You should not attempt to give it food or water unless directed to do so by someone qualified to determine the animal’s condition. Young animals and birds can get fluid in their lungs and drown if you you don’t know the proper techniques for giving them water. Never give cows’ milk, as it will make most wild orphans sick and dehydrated. Likewise, birds of prey will sicken and die if fed a diet of hamburger or hot dogs. Baby songbirds, grackles, jays and crows need a protein diet and cannot digest bread. “The best thing you can do for a stranded wild creature is to leave it in peace until you can get the advice of a wildlife rehabilitator. Veterinarians may also be able to give you assistance, although treating wildlife is not the same as treating domestic animals, so if your vet hasn’t had experience or training dealing with wildlife, he or she may not be sure how to treat the animal you have found. “Finally if, after evaluating the situation, you determine that the animal is orphaned (or injured), refer the animal to a local licensed rehabilitator. Do not attempt to treat or raise the animal yourself. “Remember, it is illegal to possess wildlife without the required state and federal permits. “Until arrangements have been made to transfer the animal, it’s best to place it in a pet carrier with a towel over it or in a sturdy cardboard box. You can put air-holes in the box, but keep them small so the animal remains in the dark as much as possible. Never put wild birds in wire cages, they injure themselves on the wire trying to escape. Wildlife rehabilitators are trained and experienced professionals, well-versed in the specific nutritional, behavioral, and environmental requirements of particular wildlife species. If an animal can not be returned to its parent, its next best chance for a successful return to the wild can be provided only by such highly skilled persons. “Many animals deliberately avoid areas where their offspring are present. Such “hiding” behaviors reduce the chance of calling a predator’s attention to the young. While you may not be able to sense the presence of the parent, it is likely close by and in visual or auditory contact with its offspring. Patiently observe the nest to see if the parent returns. If, after observation, you still believe the nest is abandoned, carefully, without touching the nest, place small sticks around it. If after a day the sticks have been disturbed and the offspring still appear to be healthy, the nest has probably been visited by a parent. “If the nest is relatively undamaged and the young birds or eggs are unharmed, replace the nest into the tree from which it fell or in a nearby tree. The parents should continue to tend the nest. A badly damaged nest may be placed into a strawberry basket or other appropriately sized basket before placement in a tree. You may need to secure the nest to the branch with twine. Note: It is a common fallacy that birds reject their young if they have acquired a human scent. In fact very few bird species possess a developed sense of smell. Excessive handling should be avoided none-the-less, as mammalian predators may be attracted to human scents in their search for food. “Frequently, birds seen hopping on the ground begging for food do not require your assistance. It is common for birds to fledge from the nest before they are fully feathered or flight-ready. They will be fed on the ground for a day or two until they are able to fly, and then may fly with a parent until able to forage on their own. Usually, if the grounded bird is a healthy fledgling, you will see a parent attending it or foraging nearby. Careful observation should help you make a correct determination. If the bird is in a street, place it under a nearby bush. If there are dogs or cats present, try to keep them away from the area for a few hours. Never unnecessarily handle or move the fledgling from the area where it was found. Baby blue jays are slow to mature, so the fledgling stage will generally take longer for them. 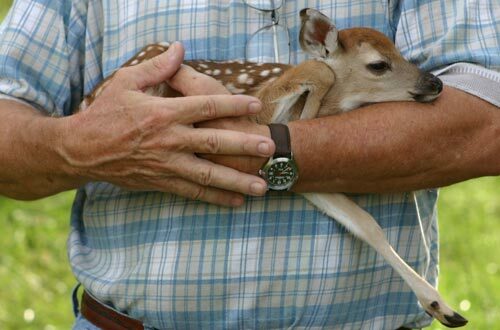 “In Texas, it is very common for people to encounter seemingly orphaned or abandoned deer. Mother deer typically leave their fawns bedded down while they are away foraging. If the fawn is not crying, is not covered with fire ants, the eyes are not swollen and there are no visible wounds, do not handle or disturb it. Your presence will only cause unnecessary stress for the fawn. Call your local game warden, or the Texas Parks and Wildlife Department Wildlife Information Line at 1-800-792-1112.